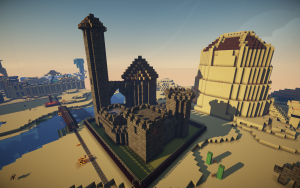 The Fab Lab hosts an open-source Minecraft server for free use. It is a [no PVP] collaboration-oriented creative mode and [PVE] survival server intended to help players who want to learn how to design and print in 3D, experiment with Redstone and build command-block-driven digital story experiences. Our server has some pretty powerful tools – learn to use them! You can prevent other players from being able to modify or destroy your creations if you protect them. Use the WOODEN AXE to make a cuboid selection like the above. Use /spawn to teleport home to the spawn. Owners have permission to add and remove members. Assets specifically for users wishing to create media and maker projects with their MC builds. The server world saves (overworld and nether) to a cloud account and can be downloaded for 3D rendering and printing every 24 hours. Extract the server directory on to the desktop, and open level.dat with Mineways. We have pictures in several locations on our Google Drive. 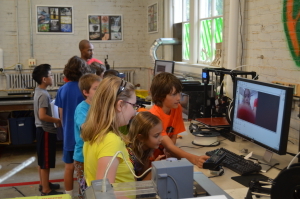 Participants in Minecraft camp learning how to do 3D scans, to import themselves into the game as statues. See more photos of 2014 camp activities. Castle model created at the Urbana Free Library. 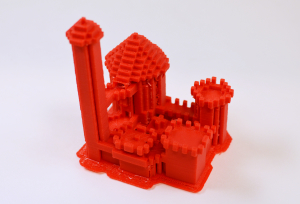 3D printed model. More 3D printed models. Castle model created at the Urbana Free Library. Screenshot in-game. More shader photos. Players who create awesome things may be featured on the website or Facebook! Players who disrespect others or destroy creations without permission may be banned. Let us know if you’d like to get a copy of our server world files or plugin settings. This section is for Fab Lab staff and volunteers. Check region info with /rg info, you can help participants work together with /rg addmember or /region addowner. A growing list of Minecraft guides that teach fairly useful real-world skills or ideas.